Aside from limited editions, spinoffs, and other side projects from Montecristo, the Nicaraguan-made Montecristo Nicaragua Series marks the first time that a third party has become responsible for a Montecristo cigar (aka the world's most famous cigar brand). And who could be trusted with such an intimidating, monumental task? Why, none other than the skillful hands of the industry's hottest craftsman: A.J. Fernández. In recent years, Fernández has provided his own spin on many of the cigar world's most iconic brands (Punch, H. Upmann, Hoyo de Monterrey, and Romeo y Julieta, to name a few), and now Montecristo can be added to the list—showcasing the fifth official, core-line Montecristo cigar (joining the likes of the Montecristo Classic, Original, White, and Platinum Series). 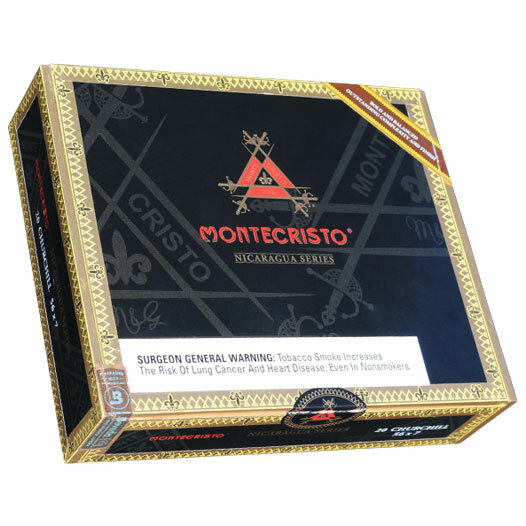 Montecristo Nicaragua Series consists of large-gauged cigars (at least at the cigar's launch), each using a Niaraguan puro blend (a specialty of A.J. Fernández). With the iconic Montecristo fleur de lis logo showcased in a new black-and-gold band design (complete with a "Nicaragua Series" sub-band), this is a much more sinister smoking experience than offered with traditional Montes. Expect a medium-full body, offering Nicaragua's signature flavors of fiery spice, cedar, cocoa, and accompanying nuances of brown sugar, toffee candy, and barnyard hay.